This September marks sixty years since the discovery of the Roman Temple of Mithras. 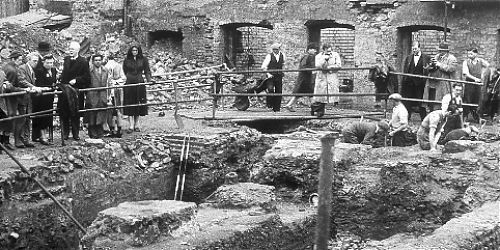 The 1954 excavation captivated public imagination, with an estimated 400,000 people flocking to visit the site over a two week period, queuing for hours along the streets of the City of London to glimpse the remains. To capture this historic event, whilst it is still in living memory, we are working with Bloomberg on an oral history project, collecting and celebrating the experiences of the people that went to marvel as the temple was exposed. Anyone who visited the site in 1954 is urged to contact us if they are interested in sharing their memories. Did you visit the temple? If you are interested in taking part in the Temple of Mithras oral history project or have images or ephemera relating to the discovery then please contact us or call 020 7410 2266 (during office hours). A trial for the project has already revealed some fascinating stories. A ticket has come to light that appears to grant access for members of the public to visit the site and perhaps even have a go at digging. The oral histories will form a permanent educational and research collection, also encompassing photography and ephemera relating to the discovery. In the 1960s the temple was reconstructed 100 metres from its original location and in 2011 the reconstruction was carefully dismantled as work on Bloomberg’s new European headquarters began. A more faithful reconstruction of the temple will be reinstated in its original position, 7 metres below ground level in a purpose-built, public exhibition space in the new Bloomberg building, to open in 2017.